The Place After Jamie’s Italian debut in Singapore’s Vivocity, the Wooloomooloo group’s The Chop House (TCH) is the newest restaurant to open at Vivocity, just steps away from Jamie’s Italian. tRP’s previous snippet post on The Chop House revealed our excitement upon knowing that this is the sister restaurant of the upscale Wooloomooloo’s group venture into the meaty market again. It is welcoming to know that the price range of The Chop House is much more wallet friendly than Wooloomooloo at Raffles City, as it’s famous steak starts from $27 (New Zealand Grass Fed Sirloin 200g). The location of TCH couldn’t have been better, with a good space in-house as well as alfresco dining overlooking the Sentosa waterfront, which is quite pleasant for an evening dinner. TCH also prides itself as having the self-service bar system, which allows beer lovers to get their own beer from the bar at their own discretion, which is definitely a welcoming idea fin our opinion given that we can get our beer ourselves whenever we want. Ironically, we did not have a beer that night, but a Pear Cider ($16) instead for a more refreshing option. The Food The ingredients of the food used at TCH is touted to be the freshest and flown in from all over the world. The beef steak is definitely on the top of our plate list, as we can finally lay our mouths on the meat from the Wooloomooloo Group at a more affordable price. To get things started, we tried the Mussels Mariniere ($18) which is cooked in white wine and garlic. The serving is not huge, and it is at most fit for sharing for two people. I am glad that the mussels are pretty fresh and I think I always enjoy my mussels when it is cooked in white wine sauce. This is a dish I recommend for starters. 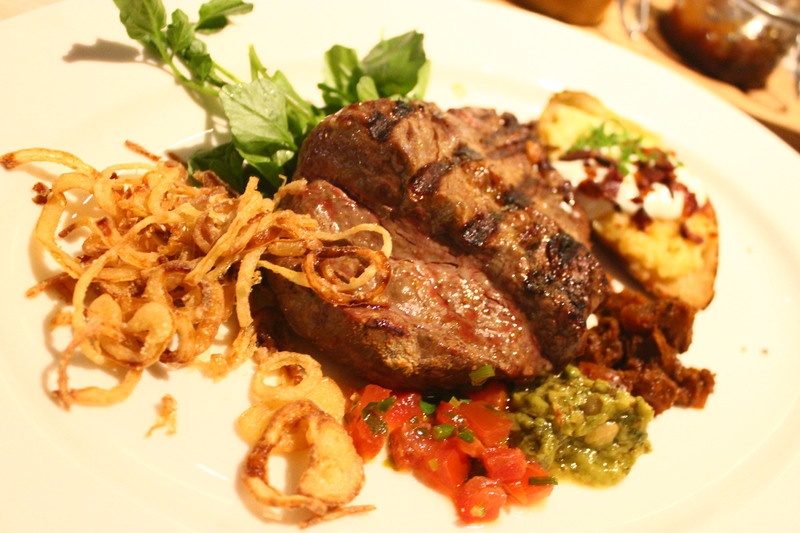 Needless to say, one of the mains we had is from the Beef selection, which we had the Australian Grass Fed Beef Tenderloin 200g ($27), which comes with baked potato and crispy onion rings as well. My expectations is probably too high, for I feel that the beef tenderloin did not blow my mind away. While the beef tenderloin is tender in its texture, the quality I feel is merely decent, slightly above the average steakhouse but not wow. Thankfully, our next mains, the Berkshire Pork Chop ($32), did arrest our attention after the first bite. The pork chop is so succulently prepared and basted in hoisin sauce that we think this is one dish here at TCH that surpasses the beef steak. The taste of the pork is flavourful, which make us forget about our burgeoning waistline as we fight for the fattiest portion of the pork chop. Trust us, you will not regret trying this dish! Rants The service is bad, period. I am not sure if we want to be merciful and attribute it to teething issues given that it is opened for a mere two weeks but still, is that an excuse for bad service? We had problems grabbing the attention of the service staff in general as they seem to be running around the whole night. It does not help that the waiter who served us does so with a lacklustre attitude. Will I return again? While there are hits and misses, it is not too bad an option in Vivocity for a casual meal. That said, with our fussy palate and expectations of food, we will not be back any time soon. Reserve your table at Chop House on Chope.co now!